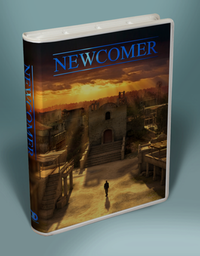 Newcomer is part classic adventure game and part roleplaying game: It contains situations and encounters like those found in adventure games and tabletop roleplaying. The game interface and controls are similar to oldschool computer "RPGs". In Newcomer the emphasis is on interacting with a large and diverse cast of characters, exploring the game world, developing a wide range of in-game and real life skills, and solving complex puzzles and mysteries. ...but there will still be a thousand situations, resolutions and encounters you have not seen yet, and 2 more game modes to complete! 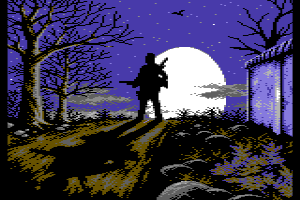 The roleplaying adventure „Ultimate Newcomer“ is still in production. 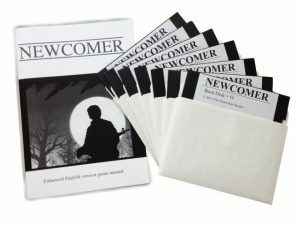 We have a couple of copies of the older version „Enhanced Newcomer“ available in our webshop again for those who don’t want to wait. Please note that Enhanced Newcomer has bugs, which may prevent you from finishing the game under certain circumstances. Of course these bugs will be fixed in the Ultimate version plus it will be compatible to NTSC and multiple devices. Frustration because of the huge amount of bugs inherited with the original code base made the project get stuck by late summer. Now we are gaining momentum again, I am doing research into new ways of optimization and tweaks that would let me insert the patches that until now I could not fit in because several parameters already reached their limits. Thanks to everybody who did not lose hope in Ultimate NEWCOMER and is still interested, and for those who would like to know more details: the new issue 60 of the diskmag Vandalism News will have an article about the project. Hoild, one of the autors of Ultimate Newcomer told us, that he is almost through with fixing all known script bugs of Ultimate Newcomer and that the next, hopefully final test phase will start in July. The disk mag Scene World (issue 20) interviewed Zoltan Gonda (creator of Newcomer, amonst others) about his current and future (game) projects. They did, of course, talk about the upcoming new release of Newcomer. There’s no breaking news in it, but it is entertaining and interesting. We receive dozens of requests for Ultimate Newcomer every month and we apologize for it taking so long, but hey – it is meant to be Ultimate. However, work is ongoing and all we can do is wait patiently, keep thumbs and express our respect to the guys in Creative Intuitive Dynamix and Soci/Singular who are making Ultimate Newcomer possible – with a tiny bit of support from Protovision. Please understand that a hobby project, especially a huge one like Ultimate Newcomer, takes its time and cannot be hurried. Stay tuned. We will keep you updated through the Newsletter. Issue 58 of the diskmag Vandalism News was released by Onslaught and Wrath Designs at Syntax 2011 in Australia. Ultimate Newcomer entering Independent Games Festival! RR-Net MK3 PrototypeDownload Vandalism News #58 from CSDb. It’s official! Ultimate Newcomer is entering the Independent Games Festival. At Function 2011 another Newcomer Remix has been released. This time it is „Newcomer Endsequence (Symphonic Rework)“ by Orphy. The original SID track was composed by Zoltán Gonda aka Bassman aka Zoli. Now there is a Ultimate Newcomer Facebook page with Hungarian and English information, forums, pictures, help screens, etc etc. Come on and join: www.facebook.com/ultimate.newcomer. A new Newcomer fan made artwork called [U]se [N]eil [I]tem [T]rap was pixeled by Leon. It competed within the multiplatform Handdrawn Graphics Compo at Function 2011 party and scored 6th (last place 😉 ).